The Yale School of Management publishes an interesting set of opinion surveys of institutional money managers and individual investors for the 23-years from October 1989 though July 2012. They asked and phrased questions so that larger percentage responses are favorable with respect to expectations. See their most recent charts, data detail, methodology and specific survey questions here. They update the data every six months. Confidence in a rising market over the next year: MAJORITY, ABOVE AVERAGE — 82.09% (compared to an April 1990 low of 47.17%, a May 2006 high of 92.59% and an average of 77.97%). Belief that the stock market valuation is NOT too high: MAJORITY, ABOUT AVERAGE — 70.24% (compared to an October 1999 low of 28.29%, an April 206 high of 88.76%, and an average of 69.84%). Belief that the stock market would rebound the day after a 3% drop: SMALL MAJORITY, BELOW AVERAGE — 54.19% (compared to an October 1999 low of 32.5%, a 72.37% April 2009 high, and an average of 61.77%). Confidence that a catastrophic market decline is LESS than 10% likely in the next six months: MINORITY, ABOUT AVERAGE — 33.47% (compared to a February 2009 low of 18.02%, an April 2006 high of 57.95%, and an average of 35.70%). Note that because 1/3 of institutional managers believe that a catastrophic market decline is less than 10% likely, does not mean that the other 2/3 think one is probable. They could have opinions anywhere from 11% likely to 100% likely. Yale does not provide banded information about opinions on that question. We see the survey results as a generally positive outlook, but with a note of caution. KEY S&P500 ETFs: SPY, IVV and VOO. The Yale data is the forward view of money managers. The Philadelphia Fed provides the forward view of economists and other professional forecasters on different, but related economic factors. It’s true that a broken clock is right twice a day, and some say the same about economic forecasts. However, the forecasters polled by the Federal Reserve are thought leaders, and therefore investor behavior change agents (including changing the views of institutional money managers) — that makes them important to consider. Each quarter the Phily Fed publishes the Survey of Professional Forecasters — a survey of a large universe of professional forecasters (mostly from banks and universities) concerning matters such as inflation, employment and GDP. 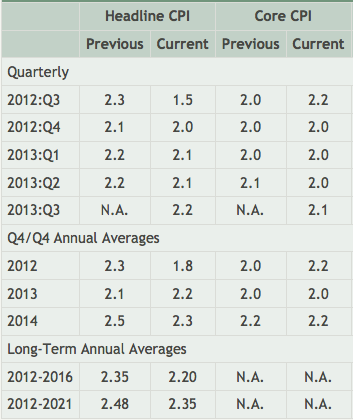 The Q3 2012 report is less optimistic than the prior report. This table shows the forecasted median probability of a negative real GDP change (“real” the amount in excess of inflation). Out to the end of Q2 2013, the risk of a negative real GDP quarter rose from 17.8% in the prior quarterly survey to 21% in this current quarter. 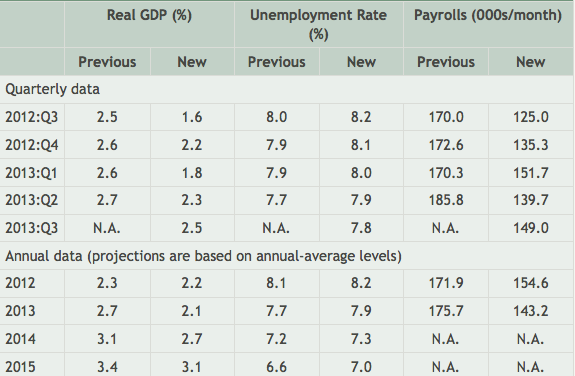 The median forecasted inflation rates are shown in this table. Consumer Price Index (CPI) is released monthly by the Bureau of Labor Statistics. The headline figure is not adjusted for seasonality or for the often volatile elements of food and energy prices, which are removed in the Core CPI. The forecasters predict a slight lowering of the rate of inflation. Unlike the forecasts above, which are from a large sample of key players, these forecasted interest rates are from JP Morgan alone. All of the future rates are up. There is no prediction of further rate reductions. While more rate reductions are certainly possible, and central banks can force and twist, the fundamentally logical direction of rates is up not down. As rates rise, bond prices fall. Longer maturity bonds rise or fall more with any given interest rate change. Consider two Treasury ETFs as they would plausibly be impacted by the rate changes in the JP Morgan forecast. IEF (7-10 year maturity, 7.59 year duration) by the Macaulay rule of thumb might decline by 2+% if the 7-year and 10-year Treasury rates change as forecasted. TLT (20+ year maturities 17.39 year duration) by the Macaulay rule of thumb might decline by 8+% if the long-term interest rates rose by 0.5% as approximately forecasted. Macaulay rule of thumb is that for a 1% change in the interest rate, the price of a bond will change in price by the interest rate change times the duration of the bond. Example: If a Treasury with an 8 year duration goes up 1% in its interest rate, its price would go down by 8% (# years duration times interest rate change, or 8 times 1%). This and every post on this blog is subject to our general disclaimer. As of the date of this post (September 4, 2012), we have positions in SPY. This entry was posted on Tuesday, September 4th, 2012 at 9:00 PM and is filed under Analysis, Data. You can follow any responses to this entry through the RSS 2.0 feed. Both comments and pings are currently closed.